It’s important to start off your email by addressing the customer by their name. If you begin with “Hi,” or “Hello,” the reader will feel as if they are talking to a computer or a robot, and it will feel cold and impersonal. Avoid this mistake, and call them by their first name. Leave them with the impression they are being spoken to directly, and not receiving a generic email. While you’re at it, introduce yourself so they know they’re dealing with a human being. People like to know there’s an actual person on the other end. Before you get down to solving their problem, empathize with the customer by putting yourself in their shoes. Think about what sorts of emotions they are experiencing. You’ve probably had to contact customer support before, think back to how you felt then and what your expectations were. You most likely wanted your issues resolved in a timely manner and to be able to speak with someone knowledgeable. “You will run into some very upset and angry customers, but it’s crucial that you remain positive in your interactions with them. Ensure you keep your focus on the solution to their problem and maintain a positive and constructive tone in your writing,” advises David Roberts, customer support manager at EliteAssignmentHelp. The way you phrase things makes a big difference. Instead of saying “that product is unavailable until next month,” you could rephrase it as “that product is available to order next month. If you like, I can place an order for you.” Removing the negativity of the word “unavailable” helps reframe the situation, and offering to place the order gives the customer a solution. Always remember to thank the customer for their feedback, and for bringing a problem to your attention. Write in a conversational tone and avoid jargon, to seem friendly and approachable. Avoid writing academically and using overly complicated language, you want to customer to be able to easily digest your information without having to reread. That will only lead to them getting frustrated and feeling stupid. Your goal to to reassure, not to lecture and risk further aggravating them. Careful not to come across as patronizing, just write to avoid misinterpretation. If you’re concerned about the language you’ve used, get a coworker to look it over before you send it to the customer. Keep your sentences short and sweet, and the customer will be much more likely to fully read and understand them. Research found a reader will understand 90% of the information in a 14 word sentence, once you get to 43 words that comprehension drops to just 10%. A good rule is not to write any sentences over 25 words. Make your message more digestible by breaking up long sentences into shorter ones, using dashes, and using bullet points. “Keep your email short and to the point, about 150 words. The customer does not want to spend time reading an email that is thousands of words long. They just want their problem explained and fixed,” recommends Eddie McAuley, customer support representative at UKTopWriters. #1. MyWritingWay and WritingPopulist – These are useful writing communities you can check out for advice and ideas about how to improve your email writing. You will find lots of helpful tips and tricks about how to improve your writing. #2. UKWritings and BoomEssays – These are proofreading tools, reviewed by SimpleGrad in Boom Essays review, that you can access to have your writing checked over for errors. #3. StudyDemic and AcademAdvisor – These are helpful grammar resources you can use to check your writing for errors and to consult if you have doubts. You want your email to appear professional or it will reflect poorly on your organization. #4. EssayRoo and Academized – These are online editing tools, suggested by BestAustralianWriters, you can use to make sure your emails are polished and free of errors. Clear communication is paramount when you’re dealing with customer complaints, so make sure your writing is edited. You will be asked questions that, as a customer support representative, seem very obvious and easy to answer. Remember that the customer asking the question is not in the industry and the answer is not so clear to them. It is quite possibly the first time they are dealing with your business and website interface; they don’t have all the knowledge you have accumulated from your job. Be careful of your tone, especially if you become frustrated, as a negative or condescending tone can harm your business’ reputation. Sometimes you won’t be able to resolve your customer’s issue right away. It’s important in these situations you don’t leave the customer hanging, wondering if you are working on their problem or have forgotten about them. Be sure you are proactive about giving these customers regular updates about how the process is going. You can also promise them a specific time when you will get back to them with an update. Doing this builds trust with the customer. 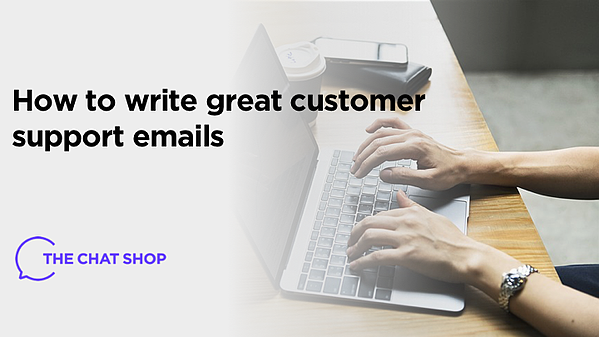 Nobody ever wants to get in touch with your customer support, but you can make the experience as positive as possible by improving your customer support email writing skills. Keep these points in mind and you will save yourself and the customers you deal with a lot of grief and confusion. Follow these eight tips and tricks to write great customer support emails. Do you like our posts on customer service? You might also like our live chat programme for customer service. Grace Carter is an editor for Revieweal and Australian Help services, there she manages content flow and helps with editorial calendar. She also creates business presentations at Essayroo, Australian educational portal.